Established in 1959, by Managing Director John Colussa, Metro Tiles is renowned for importing the latest product range and delivering high standards in customer service and tile design concepts. Metro Tiles employs over 95 staff throughout our head office and growing franchisee network of 8 retail showrooms throughout QLD. Our customers, franchisees and staff all benefit from the experience, knowledge and international relationships the management team have built - which between them is over 100 years in the tiling and design industry. We are proud to be Australian owned and whenever possible incorporate environmentally friendly manufacturing processes and source the latest ecologically sustainable products. When you visit Metro Tiles you can be assured you receive advice and knowledge that is backed up by the many years of experience and professional training of the people behind our products. Our size, reputation and service orientated commitment is the foundation in exclusively securing some of the most trendsetting, unique and highly desired tile ranges. Metro Tiles staff have a wealth of experience & industry knowledge and are dedicated to helping you produce quality projects using the best tiles, at the best price, every time. The Australian Tile Council recently gathered in Brisbane to host its Queensland Division - Awards of Excellence. Airlie Beach local residents, Rebecca & Martin Ross (pictured) had their hard work and business commitment recognised, when against a field of State wide tile stores and tiling businesses, they dominated the ceremony taking home two key industry awards. 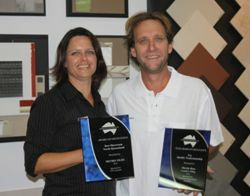 Metro Tiles Airlie Beach, received the Best Showroom North Queensland Award and Local Tradesman, Martin Ross, was awarded the Award for Excellence in Quality Tradesmanship. Metro Tiles Sunshine Coast has moved! Visit the new larger Metro Tiles showroom at the corner of Metier Linkway and Kawana Way. Metro Tiles has been serving the Sunshine Coast for almost 30 years, and with a new showroom, plenty of parking and a great range of products and promotions on offer right now, they can do it even better! If you like what you see here, ask us about it.